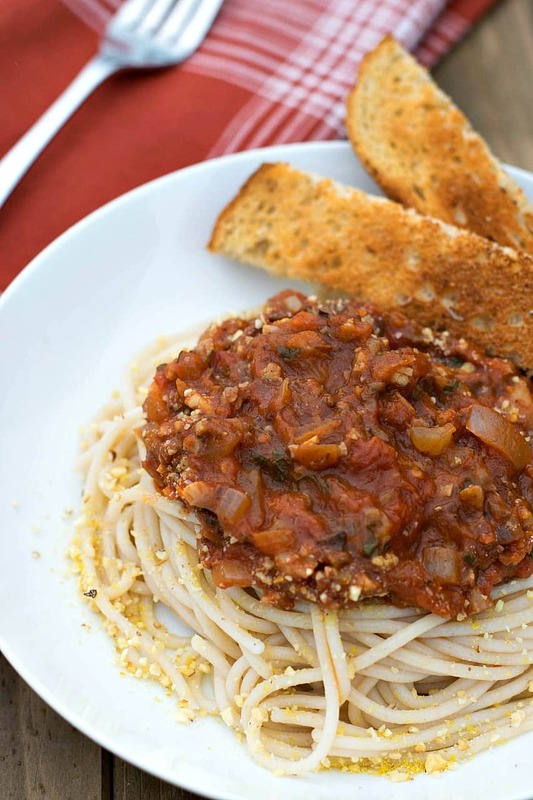 This week I’m bringing you another homemade pasta sauce – a Vegan Bolognese Sauce if you will, for those of you who have asked for something a little more, shall we say ‘meatier’ to pour over your favorite pasta. I’m sure this will be another guy pleaser so ladies – here’s another recipe that picky husband of yours might try. In fact, if they like my Tacos then they’ll probably love this sauce, as it uses my same Cauliflower Crumble mixture. The only difference is I changed the spices. 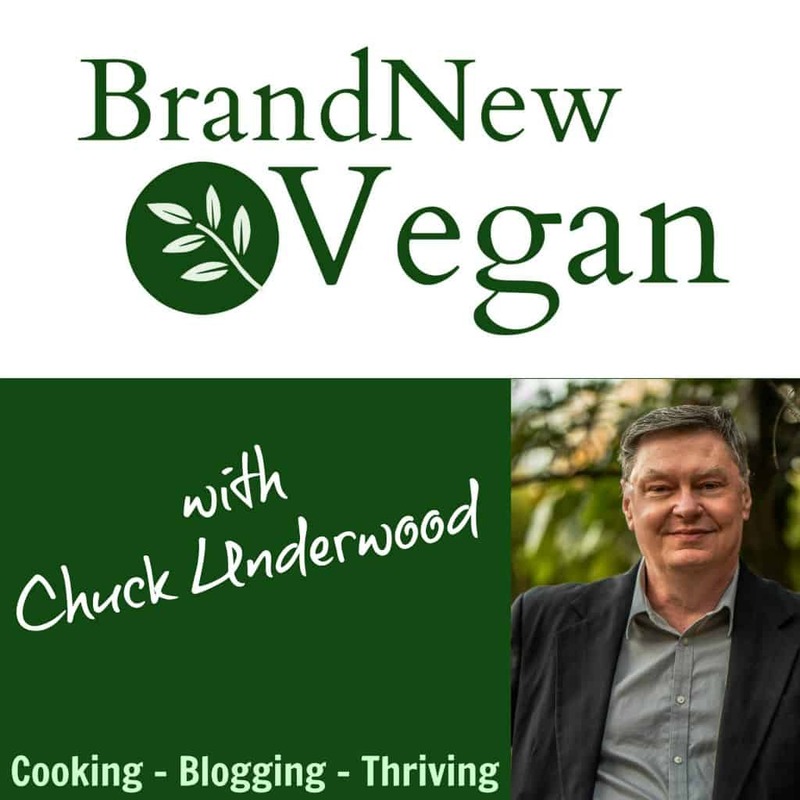 I get a lot of questions about my cauliflower meat…..
“I can’t eat walnuts” or “I hate mushrooms” or “My husband can’t stand cauliflower”. I’ll just say that you can not taste the mushrooms or cauliflower at all. But feel free to leave the walnuts or mushrooms out if you have allergies or are trying to reduce your fat. It’s a very forgiving recipe and those items add more to the texture than anything else. I also get a lot of questions regarding wine when I include it in certain recipes. In recipes like this, it really does add to the flavor, and the alcohol does cook off. But if you must replace it with water or broth, all I can say is give it a try. I won’t guarantee the flavor will be the same, but as long as you like it (and will eat it)…… that’s all that matters. Any dry white wine will work in this recipe. I used a Chardonnay and in many stores, I have seen little tiny “6-packs” or “singles” – so you would not need to buy an entire bottle. Anyway – hope you like this Vegan Bolognese Sauce. Be sure and leave those comments below! I like to get the ‘meat’ cooking first, so I can start making my sauce while it’s baking. Mix 2 cups of riced Cauliflower (those frozen bags make it so much easier), 1 cup of finely diced Mushrooms, and ¼ cup of finely chopped Walnuts together in a large bowl. Stir in the Soy Sauce, Italian Seasoning, and Paprika and spread this mixture out on a parchment-lined baking sheet. Bake at 350° F for 30 minutes, stirring once or twice to brown evenly. To make the sauce, saute a finely diced onion, rib of celery, and a shredded carrot together until softened. As always, I use 1-2 tablespoons of Vegetable Broth or water to saute with – never oil. Then stir in your garlic until it starts to get fragrant……. about 30 seconds. Its ok if the onions start to stick a little as we’re going to deglaze the pan in a minute to get all those tasty bits mixed back into the sauce. Add in the white wine and stir and scrape any browned bits. Next, we’ll add our tomatoes, tomato paste, almond milk, and all the seasonings – and give the sauce a really good stir to mix everything together. Let the sauce simmer uncovered for at least 30 minutes (or longer) to really let all those amazing flavors mix together and party for awhile. By now you’re “meat” should be done baking, and you can stir that into the sauce last. Let it cook a little longer to thicken and then serve over your favorite pasta, which in our house is Brown Rice Pasta or Spelt. To really finish this off you, can sprinkle some Homemade Parmesan on top and serve with some crusty bread, slathered with some garlicky Corn Butter……..yum! 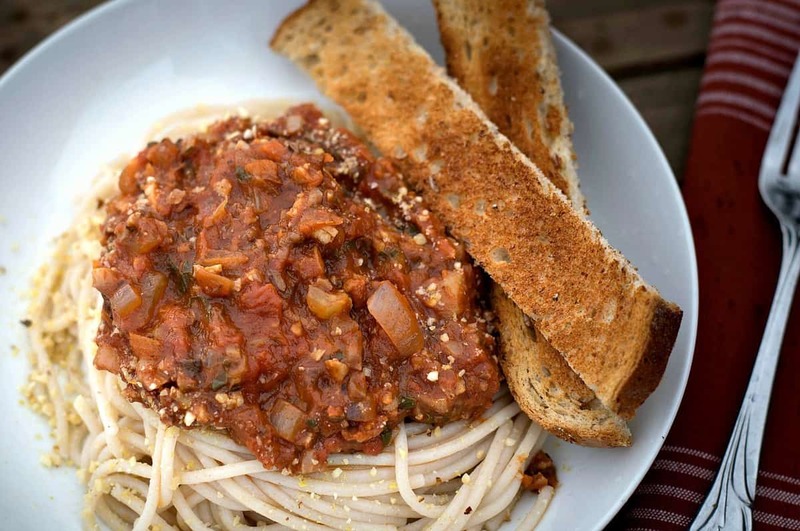 This Vegan Bolognese is a rich and flavorful sauce for those 'meat lovers' in your family. I use riced cauliflower and mushrooms to recreate the traditional 'hamburger' used in this sauce. Very rich, very flavorful, and VERY satisfying. Your husbands will thank you. Add 2 cups of 'riced' cauliflower to a large bowl. Or - finely chop about 2 cups of fresh cauliflower and add to bowl. Add diced mushrooms, walnuts, soy sauce, Italian seasoning, and paprika. Stir well to combine. Spread mixture onto a parchment-lined baking sheet and bake for 30 minutes at 350 deg F. Stir once or twice during baking. Saute onion, celery, and carrot in a few tablespoons of veg broth (or water) until softened. Stir in garlic and simmer until fragrant - about 30 seconds. Add wine and stir to deglaze the pan. Be sure to scrape up any burnt bits of onion that may be stuck to the bottom of the pan. Lots of flavors are here! Add tomatoes, tomato paste, and almond milk and mix well. Add all the seasoning and mix well. Simmer uncovered for 20-30 minutes to allow flavors to come together. Stir in the 'meat' you prepared earlier. Continue simmering until it thickens. Adjust for seasonings and serve over your favorite pasta. If you use the frozen riced cauliflower would you add it frozen or thawed ? I’m going to make this over the weekend! I would thaw it a little, so it cooks at the same time as the mushrooms….. Uh, Chuck, your reply to Tina is incoherent to me; could you please clarify? I’ve made the Taco filling (so tasty). Now that you have a bolognase sauce, I’m thinking about trying it in a stuffed cabbage casserole. I’ve had a hankering for awhile. If you dehydrate the “meat” would it have a “meatier” texture? Also, have yoy though about developing a vegan stroganoff? What type of mushrooms do you use for this? Thanks. I generally buy Portabellas for everything, unless I need a specific kind (like Shittakes for a stir fry). Baby Bellas are smaller Portabellas and are also known as Criminis. The Bolognese Sauce is awesome Chuck! I had left over sauce and made eggplant parmesan. You are a genius. I became a Patron tonight. A new years resolution was to eat more vegetarian and vegan meals, more plant based. It’s not been easy. I’ve thrown away half of what i’ve made. Finally, here you are. Hooray, finally food I can eat and my family will eat. Thank you! Only change I made was I used red wine. .i already had a nice bottle of Cabernet opened. Poured sauce over spaghetti squash. Can’t believe there are good healthy vegan recipes. Don’t feel deprived at all. After making, does it freeze well? Should…..don’t know. I never have enough left over to freeze! Yes I froze mine, it was perfect for pasta! Thanks Chuck, this was awesome!. I made this yesterday and let it cook on and off all day. It was very flavorful!. I will make it again. Left out the nutmeg, since I did not have any, not sure what I missed…. WOW WOW WOW. This was amazing and legit! So good, vegan or not. I followed the recipe exact other than being about a 1/3 short on the wine. The flavor was so good and perfect. I love all the recipes on brandnewvegan but this is one of my favorites. Thanks Chuck for all the delicious recipes. Hi Chuck! I just made this. And it is delicious ! I don’t know much about wine so I just bought the white cooking wine for this recipe … worked fine!. The cauliflower taco meat was devoured by my college aged daughter who doesn’t like mushrooms. Lol! Thank you for making such delicious recipes! You are AWESOME! How many does this serve? Am I missing it? O.M.G. I’ve basically eaten ONLY THIS for the past three days. Hands down, the best recipe in my WFPB collection! 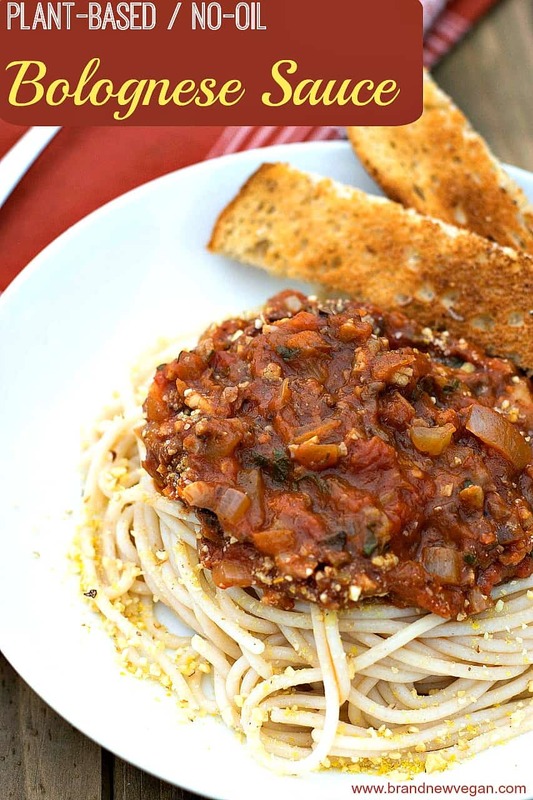 This is the only vegan no-oil pasta sauce I’ve ever liked! They are usually too thin and don’t stick well to the pasta. The riced cauliflower idea is genius. Perfect way to lower the calorie density and bulk up the meal. Thanks for sharing. I’ll have to try your tacos next. If I don’t have a husband, is this recipe okay to make? I won’t have any husband to thank me. I made this last week for the first time and I am super impressed. The “meat is incredible as a ground beef substitute (In flavour, texture and nutrition) and I will be using it all the time now as my ground beef alternative. (I just learned that 1 cup of cauliflower contains a whopping 77% of the daily vitamin c allowance with only 27 calories- so this is definitely going to become a staple in my diet – thank you).. My only future adaptation to the sauce is about 1/2 cup of wine rather than the full cup which I found overwhelmed the flavours a little too much (but this is a personal preference as someone who drinks a glass of wine only once or twice a year so it is possible my palate is hyper sensitive to the flavour. A REAL WINNER IN MY BOOKS!!! 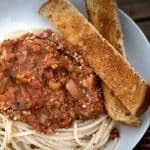 I’ve been making homemade spaghetti sauce all my life, and this is one of the best I’ve ever had! I love it, and my non-vegan friends loved it. In fact they were scooping the left over sauce out of the pan! To answer a question on here, yes, it freezes extremely well, as I always triple the batches and freeze in quart containers. Once thawed, it tastes just as fresh as the day i made it. Thanks, Chuck, for a wonderful recipe! Great recipe. Loved it with zucchini noodles. Also used the base for a minced meat variety (couldn’t convince a few kids – not mine) to try the vegan option. Worked well. Thanks!! I’ve been looking for a good meat substitute other than lentils and stumbled onto your walnut cauliflower mushroom combo. Brilliant!! I made this morning and the flavors are wonderful. Another Excellent recipe Chuck! I would definitely use red wine … coming from an Italian family who owned 3 restaurants. Not sure about the milk … so I will probably also eliminate it. I make your taco meat ALL THE TIME and love it! I make your vegan cheese sauce and mix it with the taco meat to make “cheeseburgers”!! Thank you for a great recipe, Chuck! I made this yesterday for Valentine’s Day for my family, and I will make it again soon. My wife and I very much enjoyed the sauce on whole-grain spaghetti, but our teenagers were so-so about it. They thought there were too many walnuts, but I only used 1/4 cup. I agree that even that small amount seems to go a long way in the sauce. I did not have San Marzano tomatoes so I used a can of crushed tomatoes. That, combined with the tomato paste, made the sauce seem a bit “heavy.” Perhaps using San Marzano tomatoes would make it less heavy? Or if I don’t have San Marzanos the next time, I may cut back some on the tomato paste. And I used frozen riced cauliflower. It was OK, but I am thinking that using fresh next time would give it a bit more of a meaty texture. All in all, it’s a great recipe that I will be making again soon–maybe for use on spaghetti squash as one comment above mentions. Thanks! Wow, this is soooo good! I made it last night to serve tonight. It was a big hit at my dinner party with omnivores and vegans, alike, including my 11 year son. I will definitely make this again, thank you for sharing this! A friend just brought this to me for dinner and I cannot wait to make it! It was the perfect texture and flavor. I couldn’t even wait until the pasta was cooked and ate it on a piece of toasted bread like a super hearty bruschetta. Divine. With some nutbricotta, this will make an awesome lasagna!!! !